The problem with the gun system of the Pentagon’s most advanced F-35 jet, which won’t be able to shoot until at least 2019, is just a part of the disaster of ridiculously over-complex software, an aircraft designer Pierre Sprey told RT. RT:The F-35 fighter jet has been strongly criticized. Is that warranted do you think? Pierre Sprey: The F-35 is in serious trouble, the latest is over the gun system. It is being reported that is due to a computer glitch – that is a severe understatement. What it is really due to is two things: one, the disaster of ridiculously over-complex computer software system; and two, the fact that the gun itself is mainly for the purpose of close support and close in the air combat and the air force does not think that either of those are important. But the problem with the gun is real. And it is very much a part of the overall problem of the software disaster. The software is so complicated that the air force has planned it in five different blocks. And right now, they are simply flying the first block. And still having trouble with that one. They are struggling to get the second block to work by the end of this for a kind of phony demonstration of the first operational squadron for the Marines. They may well not even be able to get the second block working. The third block is supposed to come in 2016 for another phony demonstration of the first squadron of the Air Force. And then the fourth block, which the first block that even provides for the gun, that even allows you to shoot the gun, is not due until 2019. And we won't know whether that block of software is working till the end of that year. So for now, for the next four years, we have no possibility of shooting the gun, and it is the single most important weapon for close support and for close in-air combat. Needless to say the airplane is incapable of doing either one of them at all without the gun. And even after the gun works, if it does, which we don't know, the airplane will be hopelessly incapable of close support and probably worse at close-in dogfight than the 1960s MIG-21. RT:There are three versions of the plane – do all of them have this computer glitch? PS: Well, all of them have it. The only reason you are not hearing about the Navy problem with the software, is the Navy does not even have the gun. 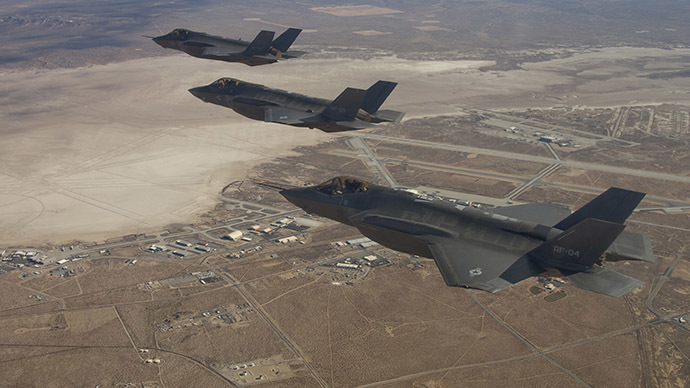 Two versions – the Air Force F-35A and the F-35B for the Marines have a gun – very important to both if they could do those missions. But it is not that it is a glitch that has suddenly arrived and said, “Oh, we were going to have a gun, we won't have one till 2019” – they never even planned to have software to have the gun work until 2019. And they are so far behind schedule, it is amazing. Since the beginning of the software engineering every year they've been losing six months of schedule. So they are supposed to advance a year – every year they lose six more months. So when they promise 2019 for the fourth version of this software that might be able to shoot the gun, it is very likely that it will be another year or two later than that. This is a promise simply based on the current schedule which they’ve never held. RT:Are the guns really that important? Is this a major drawback? PS: The guns are absolutely essential for two reasons. In close support it is the single most important weapon because when your troops are in the most trouble, when they are about to be overrun by enemies that are 40, 30, 20 or even 10 meters away – there is no other weapon that works. If you tried to drop laser guided bomb in that situation you are as likely to kill your friends as the enemies. Only the gun can be brought in that close to friendly troops to get them out of trouble. So in the deepest emergencies, the gun is the most important thing. But the air force has no interest in supporting troops. It has no interest in close support. So that is why they have scheduled the software that couldn’t even possibly shoot the gun so late in the program – because they are struggling with other enormous problems and they don't care for close support. Whether this airplane does it or not –does not matter. They’ll just promise it will do it and let’s cancel the A-10 that does it today superbly. Let’s cancel that right away and we'll wait for a while, maybe the F 35 will work and maybe it won't. RT:What impact will it have on the F-35 program? Now when it is known the jet will not be fully operational until at least 2019 – is there a chance that the Pentagon will abandon it altogether? PS: Not unless there are some enormous embarrassment. So far they are spending as much effort on public relations to try to smooth the overall problems they’ve been having in actually engineering and designing the airplane. So unless there is some terrific series of crashes, I think, for the meanwhile, there is no chance that they will cancel the program. That is exactly what they did with the F-111, which was equally a huge technical embarrassment and all the sudden the airplane wasn’t that necessary and instead of building 1,500 we only built 500. I think that is the scenario you will see for the F-35. Out of embarrassment in the next five years, they'll simply walk away from it.